They run the fastest-growing Web site on the planet. They have 100 million friends. Not bad for two guys who just wanted a place to hang out. (Fortune Magazine) -- One night this past April, Tom Anderson was surfing MySpace.com, as he does for hours every night, when he spotted a link to something called kSolo on another member's profile page. The service, Anderson learned, lets you record karaoke online and e-mail songs to friends. A karaoke man himself (he used to be the lead singer in a band called Swank), he immediately tried kSolo - playing a scorching anthem called "Cowboys From Hell" by the thrash-metal band Pantera. "It was cheesy but great," Anderson says. The next day, he told his business partner, Chris DeWolfe, to check out the site. Just three years ago, the exchange between Anderson and DeWolfe might have ended there, a failed musician and a frustrated entrepreneur bonding over karaoke. But Anderson and DeWolfe don't just obsessively use MySpace - they founded it. Last July, News Corp (Charts). agreed to buy their company, and they decided to stay on as president and CEO. 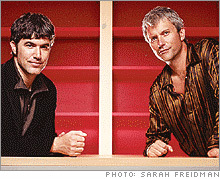 Tom Anderson (left) is the "soul" of MySpace, while Chris DeWolfe is the business brain. 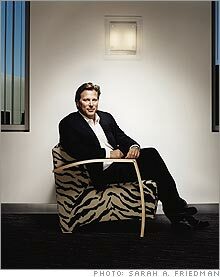 Ross Levinsohn runs Fox's growing interactive group. In three years MySpace has grown from a tiny music site into a pop culture powerhouse. MySpace starts a Web site for friends of Chris and Tom and local music promoters. MySpace premieres REM's "Around the Sun," letting users listen before the album hits retail. Redpoint Ventures invests $15 million in MySpace and its parent Intermix Media. MySpace premieres NBC's "The Office" as a full-length Webisode before the show hits TV. MySpace passes Google in Web traffic. News Corp. CEO Rupert Murdoch buys MySpace parent Intermix Media for $580 million. MySpace stages its first large-scale event, a free concert at Dodger Stadium that draws All-American Rejects, Dashboard Confessional, and 10,000 fans. MySpace teams up with Interscope on MySpace Records. Adam Horowitz and fellow Beastie Boys help launch MySpace Film at the Sundance Film Festival. MySpace starts MySpace Mobile with fledgling cellular provider Helio. MySpace launches in the United Kingdom with more than one million registered users. MySpace Comedy, featuring 8,000 comedians such as Carlos Mencia, launches. MySpace Australia opens for business with more than one million registered users. So DeWolfe tested kSolo too, playing a Bon Jovi song from the '80s. He and Anderson quickly contacted kSolo and invited its founder, Nimrod Lev, to fly from New York to Los Angeles to meet with them. Meanwhile, they sent word to News Corp. president Peter Chernin, who told his boss, CEO Rupert Murdoch, about the music site. Within a week, the media mogul struck a deal to buy kSolo as a trinket for the expanding MySpace empire. Fortune imagines Chris DeWolfe's MySpace page. It's nice to have a billionaire sugar daddy to help you build the world's fastest-growing Web site. It's even nicer to earn a really great living doing what most guys do for fun. Out of their personal passion for the music scene in Los Angeles, where they live, Anderson, 30, and DeWolfe, 40, created an Internet site to promote local acts and connect fans and friends ... who connected friends ... who connected friends ... until, by last summer, 20 million people had joined MySpace. The two had a friendship based on business, then they - quite literally - founded a business based on friendship. And when Rupert Murdoch paid $580 million for MySpace's parent company, Anderson and DeWolfe - though reluctant to do the deal - each made millions. Fortune imagines Tom Anderson's MySpace page. MySpace is nothing short of a cultural phenomenon. For those who haven't logged on, the site is the online equivalent of your high school lunchroom, your college quad, your favorite bar. Except it doesn't sell much of anything, at least not yet. It's simply a place to hang out and express yourself. The users, the hardest core being teens and twentysomethings, post profiles and decorate them with photos, music, videoclips, blogs, and links. The site is home to 2.2 million bands, 8,000 comedians, thousands of filmmakers, and millions of striving, attention-starved wannabes - 100 million, actually. MySpace passed that number of registered users in early August, and on a typical day, it signs up 230,000 - roughly the population of Scottsdale. A year ago it passed Google in terms of traffic, and now MySpace ranks second to Yahoo in page views, with one billion daily, according to comScore Media Metrix. While there are hundreds of "social-networking" sites - Facebook, Friendster, Xanga, Bebo, Cyworld, to name a few - MySpace, the most risqué and chaotic of the majors, accounts for 82% of traffic in the category, according to Hitwise, a leading Web site tracker. With Murdoch's backing, the site has an astonishing number of projects underway: a Google pact to sell text ads on the site; a MySpace Records label; a VoIP feature to let users call one another; international sites in Britain, Australia, France - with nine other countries in Europe and Asia coming soon. DeWolfe counts 20 new products in the development pipeline. "We think we can extend MySpace around the world and it can be a major force globally," says Murdoch, whose Internet ambitions have helped drive News Corp.'s stock up 18% this year. That, however, puts the MySpace guys in an awkward spot. They founded their Web site on the principles of user control, grass-roots growth, and authenticity. "The users govern the site," DeWolfe says adamantly. But now he and Anderson have News Corp.'s financial targets to hit, a "chief revenue officer" to contend with, and serious pressure to make MySpace safe for advertisers. Already there's a backlash. Witness sightings of "Tom Is Not My Friend" T-shirts and fake Murdoch profile pages headlined FUQ RUPERT and EVIL BILLIONAIRE TYRANT! The question facing the MySpace founders now: Is it possible to sell out without selling out? It was well past midnight, and Tom Anderson was hard at work. He had been hunched over his computer for 8½ hours, refused to break for dinner, and showed no signs of letting up. Why? Well, the "work" was actually scouring MySpace for amazing indie bands. After a meeting to brainstorm about a new venture called MySpace Records, he and Interscope Records senior vice president Luke Wood decided to take a look around for some promising talent. As often happens, MySpace addiction set in. "We sat around his computer from 6 P.M. to 2:30 in the morning and did nothing but listen to unsigned artists," Wood recalls about that night last year. "Tom experiences music in an innate, primal way." Successful startups "tend to have one person who is the soul of the business and inherently understands the users," says Geoff Yang of Redpoint Ventures, who invested $15 million in MySpace early last year. "The other is the smart businessperson who has a compelling vision." Anderson, then, is the "soul." Typically wearing a trucker hat and flannel shirt (even on 90-degree L.A. days), he has an unvarnished, forthright manner that makes him seem almost childlike. He spends a lot of days toiling with the techies at MySpace to put out fires or add new features to the site, though lately he's been getting pulled into meetings about partnerships and ad ideas. He sees his role as the "guardian" of the user. Most evenings he's at home alone, surfing the web. Since his band Swank broke up in 2000 (he clashed with a fellow band member), Anderson has had little time to play his guitars or go to L.A. clubs. Still, Anderson has racked up 100 million online friends. DeWolfe, meanwhile, has 177. Married to a former record executive and newly a father, the businessman with the vision is a lot more polished than Anderson and a lot more guarded. In person, with his laconic charm, shaggy gray hair, and string-bean frame, the 6-foot-3 DeWolfe comes across as uncompromisingly cool. Though he paints himself as a workaholic - at the office from 9:30 A.M. to 9 P.M. most nights - he allows that he spends weekends at a beach "a little north of here" (a downmarket rental in Malibu). He begs me not to name the chic Colorado town where he skis in the winter (it begins with an A). Asked why he's so guarded, he replies anxiously, "I'm - by nature, I'm not a flashy person. It's just not who I am." Unlike Anderson (and most MySpace members), DeWolfe prefers not to express himself. He keeps his MySpace page private, though he agrees to "friend" me so I can see it. Under "Chris's Interests" he lists: "Work, trying to figure out new people I meet, going out to bars/clubs (once in a while) ..." Hogan's Heroes and Lost in Translation - about a washed-up actor searching for meaning in Tokyo - are first on his list of favorite TV shows and movies. In the "About Me" section, he writes, "Usually friendly - but sometimes prickly. I like being around creative people, funny people, crazy people." MySpace's laid-back, anti-authority vibe has everything to do with where its founders came from. DeWolfe, who was raised by two teachers in Portland, Ore., bucked the family tradition by studying business at the University of Washington and then going to USC's Marshall School of Business, while Anderson, whose entrepreneurial father "had one crazy idea after another," rebelled by majoring in English and rhetoric at Berkeley, bouncing from band to band, and eventually going to film school. The two met in 2000, when Anderson, deep in student debt, answered an ad to earn $20 testing a product for Xdrive, a data-storage company. He hated the Xdrive product. But DeWolfe, who had landed a gig as the company's head of sales and marketing, liked Anderson's candor and offered him a job. "Chris rescued me from a lifetime of unemployment," says Anderson, who immediately took to DeWolfe's hands-off style. "I remember, I asked Chris, 'What do I do?' He said, 'Go figure out how to make money.' That's why I always liked working with Chris. It was never, 'Here's the job I want you to do.'" While Xdrive ended up in bankruptcy (a casualty of the dot-com boom), the pair's second venture, an Internet marketing firm called Response Base, took off: Within a year they sold it to an outfit called eUniverse for several million dollars and joined the company. Around this time, in late 2002, Tom decided that social networking should be their next big bet. "I had looked at dating sites and niche communities like BlackPlanet, AsianAvenue, and MiGente, as well as Friendster," he says, "and I thought, 'They're thinking way too small.' "
Hating the idea of any rules, Anderson and DeWolfe insisted on building an "open" site. Any stranger could peruse any profile, join the community, and post pretty much anything he or she pleased. That made raising money - at least at first - tough. "We'd get calls from investor types who wanted to meet us," recalls Anderson. "They would say, 'Your site isn't professional. Why do you let users control the pages? They're so ugly!' " DeWolfe says that just about everyone, including key executives at eUniverse, told them, "You can't make money from user-generated content." Then the founders got lucky. In February 2004, eUniverse recruited a new CEO, Richard Rosenblatt, who embraced social networking. "I told them, 'I think this is where the future is going," recalls Rosenblatt. "I allowed them to hire tech people and invest in additional servers. Euniverse was losing $4 million a quarter, and even though they had no revenue, I pulled money from our profitable businesses to support MySpace because I thought Chris and Tom were the most innovative marketers I'd ever met." But MySpace just kept signing people up. At the same time, rival Friendster, which was once the hottest social-networking site, was stumbling badly, giving Anderson and DeWolfe a lucky break and a roadmap for what not to do. "We grew so fast and could never keep up," admits Friendster president Kent Lindstrom. "Our page-load times were 20 to 30 seconds when MySpace's were two or three seconds." Secondly, Friendster management sanitized its site - much to Anderson's delight. "They had no room for fakesters," Anderson says. "If a dog or a city or an idea had a page, they would delete it. Could anything better have happened to us? People said, 'I'm going to go to MySpace because I can do what I want there.' "
Murdoch did have some ideas, though, about running the business, as Anderson - "who is nervous that we'll put him in a straitjacket," according to Murdoch - quickly learned. A few months after the acquisition, News Corp. disclosed plans to move MySpace from Santa Monica, a block from the beach, to Beverly Hills, where News Corp. was consolidating its Internet properties. Anderson and DeWolfe were horrified. Over drinks at Casa del Mar, a hotel in Santa Monica, Anderson laid out his objections to Chernin, arguing that the move would wreck the laid-back MySpace culture. "What I like about Tom is that he's so straightforward," says Chernin. "If something's bothering him, he comes right at you." Chernin listened and said he'd call in a couple of days with his decision. "I'm a little lost," says DeWolfe. We are winding through MySpace's spanking-new headquarters in TheirSpace - the second floor of Fox Interactive's sleek gray granite office building on Maple Drive in tidy Beverly Hills. A maze of gray cubicles and red walls, the MySpace space even smells new. Compared to mellow Santa Monica, this is, well, different. There are, for example, no good lunch spots nearby, unless you walk five blocks to the Four Seasons Hotel. Not exactly a MySpace hangout. So until the Fox cafeteria opens in September, MySpace provides free boxed meals - breakfast, lunch, and dinner - to all 300 employees. Do they hate the place? No, insists DeWolfe, but he says, "We've gotten a dose of reality. We don't own the site anymore." Anderson is more candid: "Before, I could do whatever I wanted. Now it takes more time to get people to agree on things. All the budget reviews and processes. That can be a pain. But it's not stopping us." The upside, of course, is the sugar-daddy factor: that deep-pocketed parent to back your best ideas. Of the 20 new products in development, DeWolfe is particularly excited about VoIP, the 11 new international sites, and MySpace News. Several e-commerce deals - including a likely partnership with eBay or Amazon - are in the works, as is a MySpace Sports site and MySpace Fashion. DeWolfe and executives at Fox Interactive Media, which oversees more than 20 News Corp. Internet businesses, are also upgrading MySpace's photo- and video-storage capabilities to compete with the likes of YouTube and Yahoo's Flickr. "Chris and Tom are adamant about trying to wage war on a feature basis rather than by blocking access (to other sites)," says Michael Barrett, FIM's chief revenue officer, who joined News Corp. from AOL in June. Wandering past warrens of tech developers, 140 of them, DeWolfe explains that a quarter of these folks are working on new features for the site. "We're hiring as many people as we can as fast as we can," he says. MySpace needs the upgrade. The site crashed for half a day in late July. Page loads have slowed dramatically, and the site, say tech bloggers, suffers from inadequate hardware and junky code. DeWolfe gets prickly about such criticism. "You could argue that MySpace pushes out features too quickly," he says, "but we also create more features than anybody else on the Internet." Under pressure to deliver profits - the business brought in just under $200 million in revenues this year and lost money after acquisition-related costs - the entrepreneurs are building MySpace's ad sales force. They're also collaborating with FIM executives to raise ad rates (an ad on MySpace's home page goes for less than Yahoo's rate of around $600,000 a day) and attract more national advertisers. MySpace already has a lot of them: Coke, Pepsi, Procter & Gamble, plus the major automakers, mobile phone carriers, and film distributors, who can't open a youth-targeted movie these days without a MySpace page. Given that MySpace is raw and bursting with sexual material, the trick is make the site feel safe for advertisers yet authentic for users. P&G, for instance, built a page for a new version of Crest toothpaste titled "Miss Irresistible." While the page has accumulated 38,267 "friends" and more than three million page views, a MySpace monitor constantly scans the page and removes raunchy "friends." Advertisers such as Honda, Unilever, and Wendy's also have posted profile pages, which sell for $100,000 and up. Two Pepsi brands, Sierra Mist and Aquafina, sponsor MySpace Comedy and MySpace Film, respectively. There are some lines DeWolfe vows never to cross. Would MySpace do pop-up ads or charge bands to promote their music? "Not as long as I'm here," he says. Levinsohn, too, appreciates that users rule on MySpace. "If we shoved professionally produced content onto MySpace, we'd be going against its charter and against everything we believe about where the Internet is going." But Murdoch and his fellow authority figures clearly want to use MySpace as a distribution arm. In mid-August the company announced plans to sell Fox TV shows and movies on MySpace, and Murdoch says he's been approached by other networks. "Whether it's a CSI or Law & Order or Desperate Housewives, we'll welcome the content." DeWolfe says he's fine with the plan - though he wants to find a way for advertisers to pay for the downloads. What, exactly, is MySpace turning into? DeWolfe says he sees it as a "lifestyle brand." But a brand has to stand for something. And with all the growth and evolution of the site, it's hard to fathom what that lifestyle even is. No question, the MySpace user base is changing. Some 87% of users today are 18 or older; 52% are 35 or older, according to comScore. Might MySpace become too big and broad and successful to be cool? One MySpace observer, Martin Sorrell, who heads ad giant WPP, believes it could: "MySpace could be like a fashion brand. The more successful you get, the more common you become." DeWolfe disagrees: "We're not deciding what's cool. Our users are," he says. "MySpace is all about letting people be what they want to be." So you have to wonder. News Corp. employees - is that what Anderson and DeWolfe really want to be? Their contracts expire in October 2007. They won't talk about their plans, but friends say that the guys really don't know what they'll decide a year from now. As Chernin puts it, "It will become apparent whether it's meant to be. I mean that in a mutual sense. Their lives have changed. They need to find their lives exciting and engaging." At this moment at least, Anderson says he's excited enough: "I'd like to do this as long as it's fun, and that could be a long, long time." DeWolfe is more cautious. "It's pretty simple," he says. "As long as we both enjoy walking in the door each morning and we maintain a certain autonomy and we control the direction of the site ..." He stops there. He'll stay at MySpace if he gets all that? Not so fast. "Just say we're happy working here."